You won't find many photographs of Cliff Bennett and his band of budding musicians much earlier than this one. It was kindly sent to me by Mike Currell who was one of the founder members of the Rebel Rousers. The picture above was probably taken during the autumn of 1957. 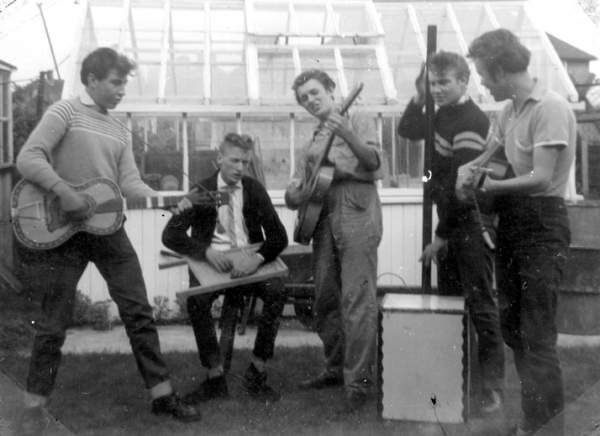 It shows the group practising a skiffle number in Mike Currell's back garden. Left to right are:- George Mattingley, Dave Edmonds, Cliff Bennett, Ben Jordan,and Mike Currell. Mike tells me that the washboard and tea-chest were items inherited from another local bunch of musical wannabees- these were the Ted Woods Skiffle Group. Teddy Woods was the younger brother of Arthur Woods, and older brother of Ronnie Woods (Faces/Rod Stewart/Stones). They lived on the next street and proved to be inspirational in getting Cliff and his mates interested in forming a group. Arthur had started a band, but was called up to do his 'National Service' and Teddy took over for 2 years. When Arthur returned he reformed under 'The Arthur Woods Combo", later the "Artwoods". Mike Currell tells me that the Woods had the best musicians, but Cliff's rock and roll vocals became a more popular local choice than Arthur's more sophisticated Jazz/R&B approach. The list of musicians listed at the top of this page are all those that Mike can remember, or are listed in the precious log book for the group that he has kindly given me access to. Some of the group members were only transient and perhaps only played on one gig. Nevertheless, I have listed them all in the hope that they may somewhere jog a memory or two. Percussionist Dave Edmunds was replaced by Alfie James in February 1958 and that line up was maintained until the acquistion of saxophonist Sid Phillips in September of the same year. They played their first gig as rock and rollers on 9th May 1958 at the Red Leaf Jazz Club in Hayes. This also proved to be their last night to play at that venue which may not have been just coincidence. "First posters with 'Rebel Rousers' as the name, was for the first night at the 'Osterich Inn' in Colnbrook (6 Oct 58). We had toyed with the name from when we got our first amp and I had learned the guitar part to the Duane Eddy tune. It never became the signature tune until Sid joined and could play the Sax part. From then on we used it as the nightly opener and closer. The first rock tunes we learnt and played in public (Robb's Fisherman's Club, 10-May-58) included 'Rockhouse' and 'Undecided' by Johnny Burnette, 'Ooby Dooby' by Roy Orbison, '20 Flight Rock' by Eddie Cochrane, and 'Whole lotta woman' by Marvin Rainwater ( I screwed up the hooks real bad, and we never played it again!). We had just enough to do interval spots (Cowley Hop, 07-Jun-58). The response from the 'Teds' and even the 'Mods' was a fair indication that the Trad/Skiffle boom had run its course. This didn't matter to us because 'Rock n Roll' was the only thing we wanted to play. We never played skiffle again." 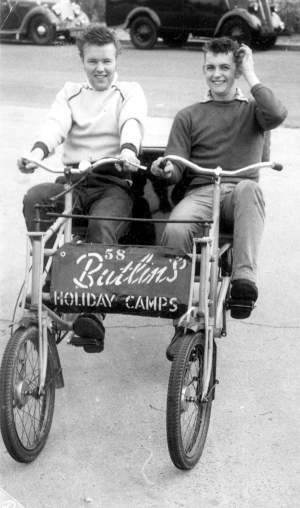 Here's another amazing picture- probably taken during the week of 2 Aug - 8 Aug '58 at Butlins Holiday camp in Clacton. It shows Mike Currell and Cliff Bennett taking advantage of some of the facilities. For more about the early days of the Rebel Rousers, just click here.